I don't publicly address this topic often because I find it unnecessary to discuss what I don't believe in. My objective is to always openly talk about and push what I do believe it. It causes confusion to do both. I believe in positive reinforcement and I believe that food is such a gift and it wasn't meant to cause so much harm, physically and emotionally. Yet, here we are in 2019 and we still have over 70% of adults in our country unhealthy. I don't like to say overweight and obese because many people considered overweight have better numbers (blood pressure, cholesterol, glucose, triglycerides, etc). I don't judge much on weight, in fact, I don't like to judge at all. I like to teach a program that strengthens your mind to make long lasting good choices. Did I mention carbs fuel our brains? I like to empower people to feel healthy and confident without extreme conditions. I like to encourage people they're only one meal away from being back on track. The goal always remains the same=consistency! With that in mind, for your 2019 health goals, pick a plan that you can do consistently. The CCN Way of Life teaches that you need 4-5 meals a day. Each meal is macro balanced with a ratio of 50% carbs, 20% protein, 30% fat. We teach that you eat real foods, so quality and quantity matter. With our program, eating every four hours and this combination, you will burn fat as your fuel, all day and night...even if you didn't work out. Our program works because it's a way of life and not a diet. You can eat your treats and celebrate birthdays and go on vacations and still continue the CCN Way of Life. Consistency is easier following this way because you will be personally satisfied with food and results. Now, let's talk carb cutting. We believe at CCN through science that there are 6 essential nutrients, broken down into 3 macros and 3 micros. The 3 macros are CARBS, fat and protein. Whenever a program removes an entire essential nutrient or decreases it to minuscule amounts, that should be a huge red flag. 1. They aren't sustainable. This isn't something you can easily comply with socially or physically. They are short term and can cause long term damage. 2. Long term damage. 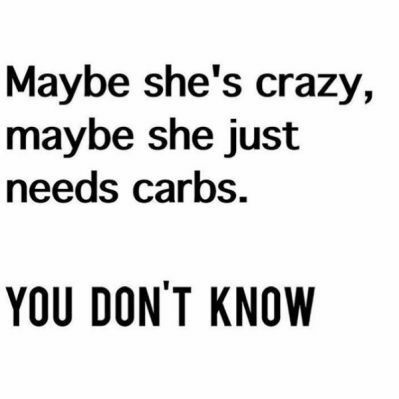 low/no carb diets can cause are: insulin resistance once you start eating carbs again, low energy, lack of mental capacity, anxiety, hypoglycemia. 3. Bad breath- ketones being released by the body to burn fat release certain chemicals that cause bad breath. No fix here except to eat a balanced diet. 4. Organ Confusion- our bodies need fuel for functioning. We think of fuel/calories in terms of exercise, but we actually need fuel all day every day to keep things running smoothly. Carbs are the most effective way to fuel bodily functions: hormone levels, regulating body temperature, digesting food, etc. If we go too long without them, we could potentially cause our livers and kidneys to work too hard borrowing "fuel" from them. 5. Water weight. If doing this was for weight loss, great..you will achieve VERY short term weight loss because carbs do carry a good amount of water weight, so depleting your system will likely change the scale...until it doesn't. When this stops working, you've experienced the plateau of all plateaus because you've exhausted all options. PERIOD. Number 5 is the best thing about CCN. IT's not water weight..it never was water weight. We eat carbs to fuel our brains and bodies and target fat cells. We keep the glucose in our bodies balanced and usable. We eat the right amounts to optimize nutrient absorption and keep our organs doing their jobs. Guys, if you're seeking weight loss, short term success is likely not going to be your savior. If you desperately need to try low/no carb, just be sure you are being monitored by a medical physician. It can truly cause more harm than good unless you have the correct tools. I have seen these types of diets be effective for a very small percentage, but it's because they have medical advice and a plan to eventually shift back into a normal way of eating. Don't let 2019 be a yoyo year for you! Make consistent, good choices and use food for what it was supposed to be...fuel!